I recently returned from Atlanta where I had an opportunity to played the two top 100 courses located there. I have always liked Atlanta for its Southern charm, weather and respect for tradition that is part of the culture. Atlanta still has true gentleman. Peachtree (ranked #87 in the world) is the better of the two courses, East Lake being the other. Golf in Atlanta and Bobby Jones are inseparable. Jones grew up playing golf at East Lake Country Club. The story goes that Jones and a group of his friends grew frustrated at slow play at East Lake and thus founded Peachtree. Bobby designed the course with Robert Trent Jones Sr. in 1948. 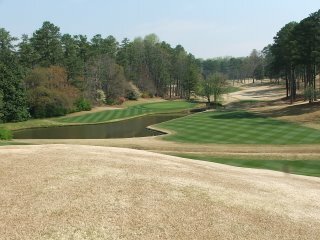 Peachtree only has 225 members and on the beautiful Spring day I played it we saw only two other group all day. The terrain is some of the hilliest I've played thus far (although the Olympic Club Lake course is hillier). It is not an exaggeration to say that the only flat lies you are likely to get all day are on the tee boxes. Many of the approach shots are to elevated greens, thus the course plays longer than the card indicates. I have encountered only two courses with faster greens than Peachtree: Merion and Oakmont. The course also has an ever-present creek that winds itss way around the course and is always ready to catch a wayward shot or to penalize those that should have hit three wood off the tee but through their hubris take the driver. Comparisons between Peachtree and Augusta are inevitable because Bobby had a hand in designing both; their respective topographies are very similar and Peachtree, like Augusta, was previously a nursery. Several of the vistas a Peachtree could be mistaken for those at Augusta. Peachtree is a decidedly low key affair, the clubhouse is understated, the grill room is understated and the membership is both low key and low profile. I am a fan of golf clubs like Peachtree. An interesting historical note is that the Union General William Tecumseh Sherman slept in one of the clubhouse buildings at Peachtree, which at the time was a private residence, on his march through the South. "The course is not a brilliant design and is not particularly picturesque either." There ya go. So why is it even in the Top 100? it's not a groundbreaking course, but east lake is good partly because it's simple, classic and old fashioned in it's design. it's not a great course based on design alone... but atmosphere and history play a part in making the course what it is. as you say it's hard to not think about bobby walking the fairways. I was lucky enough a few years ago to be able to play there anytime i wanted for a whole year, and you should experience it in the summer when the grass isn't dormant as it was when you went... the trees on islands of pine needles, the shimmering lake, never being more than a hole and a half from the clubhouse... when the trees are lush and green and the georgia heat causes you to take an hour lunch (read drink) break... i'll tell you i've played augusta and while augusta is a far superior course in design, you can feel where bobby drew a lot of his inspiration from. plus i like the fact that you're often one of only a handful of groups out on the course. The top 100 must be driven by American Magazines alone. There has to be 100 courses in Australia alone better than this. I'm afraid I agree with the comment regarding East Lake favorably comparing with Augusta. The design of the course is not necessarily standout but there is something very charming about it, and in the height of summer it is visually as pretty as Augusta. East Lake is a classic course and it is truly an experience to play. It is a wonderful Rees Jones rendition of a classic Donald Ross course. and dull is so close that one person's boring is another person’s genius". Here's the bottom line, if you can appreciate the subtle brilliance you will like East Lake. Hole 12 is amazing, but it can easily be mistaken as boring. 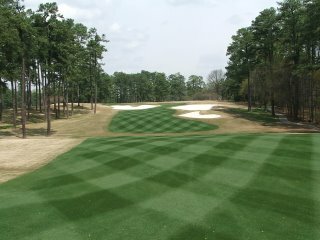 It is a classic Redan design, but on a par 4. Green is elevevated and slopes backwards right to left with a massive bunker in front. This makes for a very tricky approach shot. There is one trap in the fairway...but every time I play it at least one member of my group is in it. Can you say strategic placement? Hole 7 is one of the most difficult holes I've every played, hole 8 is a wonderful "strategery" short par 4 hole, and 9 is a wonderful par 5 beast with a water carry on the second shot. The Tour Championship is right around the corner and the rough is growing out the zyosia fairways are immaculte. Great course that is brilliant in its subtleness. However some might prefer a course like Cascata (in Vegas Baby!!!) which is anything but subtle. Wonderful still, but the anti-thesis of East Lake. Isn't golf great? No matter what your preference regarding golf course architecture, you can find a course that suits your desires! "Funny thing is, I also was able to play there for a whole year, and I also played Augusta. I may not know who wrote the comment but I know what you are!" Just a historical note. Its William Sherman, not George Sherman. William Tecumseh Sherman, one of the most famous names in the Civil War. Peachtree is known to be almost as exclusive as Augusta, how did you invited to play?